According to the theory of yin and yang, which originated with TzouYan (鄒衍, צו-ין BCE 305-240), founder of the Yin-Yang school of philosophy called JiXia XueGong; the “JiXia Academy” or “agricultural downs (稷下) Academy” (XueGong: 學宮) and also called naturalistic thought or "quantum philosophy," Confucianist Chinese history is organized through the legendary emperor FuXi (伏羲 BC AYN 2760-BC AYN 2697). Naturalistic thought explains that the great ultimate TaiJi (太極) engendered yin (יען) and yang (ינג); “the essential elementary forms or genders” producing (生) LiangYi (兩儀); the “pair of gifts” that are the “2 attributes or properties” (assets), the basis of the philosophy of oriental ontology, mechanical materialism, and the subsequent TianGan (天干); "celestial stems" or ShiGan (十干); "ten stems," the oriental versions of the Hebrew 10 Sepheroth or Emanations. “Out of the void (בהו) comes the Tai Chi, God’s input,” the Tai Chi (太極) is the primary Li (里); "reason" in the formation of the universe, out of the 11-dimensional transcendent DaWuGan (大戊干); the "great spear-line X (ten) doing." WuJi (ואו-קע, 無極: 무극, מאו-קעך); empty or limitless (+∞ plus infinity) is also the Ain Soph (אין סוף) of the Hebrew tradition means “without end, infinite or limitless” referenced in Genesis 1:2: theo (תהו); the "formlessness, confusion (chaos), unreality or emptiness" (RenDiCai: 壬地才) matched with the impulse of creation gives birth to or produces YouJi (יעו-קע, 有極: 유극, יע-קעך); the “delimited,” or the “exist extreme,” “angle,” “curve” or ridgepole, the conception of fences, boundaries and conditions, the TaiYang (太陽); "greater positive" and the beginning of the Kav or Qu (קו); “line” or ray (ראי) able to create finitude, which extends out of the withdrawn infinite light into the vacuum along the Samekh-Path line in the Universal Syphers™ theme, representing the veiled; veil of Paroketh or Tiphereth or concealed finite potentials in the Ain Soph (אין סוף). YouJi (有極) the existing extreme angle or curve in the form of warped spatial existence in balance is symbolized by the TaiJiTu (太極圖): ☯; the TaiJi (太極, תקע, TaeGuk: 태극, תקעך) image or diagram (圖) of supreme polarity; “quantum states,” centrally balanced in neutrality. The emanations arise out of three preliminary states or three negative veils that are considered to precede manifestation during the Period of Restrained Quantum Gravity. The first is a state of complete nullity, known as Ain (אין) "nothing" or Wu (無) called the veil of the abyss, the second state, considered a "concentration" or focus (Semadhi) of Ain, is Ain Suph (אין סוף); "without limit, infinite or limitless," the WuJi (無極) of the Chinese tradition called the veil of paroketh or Tiphereth and the third state or three absolutes or extremes (三極), caused by a "movement" (רחפת) of Ain Suph, is Ain Suph Aur (אין סוף אור); "limitless light" or YouJi (有極) incurring the veil of Yesod and with this initial brilliance or radiance comes the first emanation (Chether-JiaGan) of creation originates with the TaiYang (太陽); “greater positive." In the Lurianic Kabbalah scheme, creation is initiated by a primordial radical divine Bittul (בטל); "selflessness" or self-withdrawal," as the evaporated dew ceases or e.g. the sun-set, called Tzimtzum (צמצום); “contraction, constriction, condensation or possessiveness,” forming a figurative Khalal (חלל); “vacant, free or empty" Hapanui (הפנוי); "space or vacuum of a light far thing" (חלל), e.g. the sun's-transit, or hollow-man in which only a residual reshimu (רשמו, rasmi); “his impression, sensation or imprint,” inscribed or signed part remains of the withdrawn (the sun-set) Ain Soph (אין סוף) that moved (sun-transit) through Ain Suph Aur (אין סוף אור), e.g. the light duration of the sun-transiting. Subsequent to this, a thin, diminished new emanation Kav (קו, Ka-wa) ray-line, able to create finitude, extends out of the withdrawn infinite light (sun-set) into the Khalal (חלל); “vacant, free or empty" Hapanui (הפנוי); "space or vacuum of a light far thing" (חלל) where the sun-transited visibly, the Samekh-path line, illustrated in the lower FuXi 3rd/3 branches: World of the Jaguar. Before the tzimtzum (צמצום), the contraction of the infinite light Ain Soph (אין סוף) that gave birth to creation, only the Ain Soph existed, as the Kav (קו) ray-line of divine illumination shines into the Khalal (חלל) primordial space of the light far thing, creation begins (the sun-rise), the TaiYang (太陽) of Chether-JiaGan. The tzimtzum (צמצום) reveals the Ten Sefirot/Sepherot (ספרות) in transcendence the 1st time or context, in Asian terms ShiGan YinYang (十干 陰陽); the “10 shields, spheres or doings of Yin (陰) and Yang” (陽) echoing the first verse in Genesis 1:1: “God created the heaven and earth;” Yang (陽) and Yin (陰), the two essential elementary forms or genders with the ten value-archetypes through which the creator or Deity creates and structures the world of ten emanations of visible light, and these are first expressed through the Iggulim(עגלים); concentric “circles” or rings of the FuXi LongXih (伏羲 龍解), linking the Qabalah (קבלה) to the Aristotelian system of heavenly spheres and the school of naturalistic thought. The battle (בטל) or war in heaven of Revelation 12:7 in which "Michael and his angels fought with the dragon (תנין: Tinian); and the dragon fought and his angels," being the FuXi LongXih (伏羲 龍解) the 1st/3 ShiGan (十干) to emerge from Adam Kadmon to occur before any catastrophe, shattering, big bang or symmetry breaking of creation. According to Mormonism this is the Arch-angel (Samekh-path line) Michael-Adam, including the Hebrew tradition this would be Michael-Adam Kadmon. The actual battle is between the dragon-FuXi LongXih (伏羲 龍解), the first and old world of concentricity and the coming new world of the 2nd/3 ShiGan (十干); the "Bu ShiGan TaiJi" (部 十干 太極). Olam katan (עולם קטן); “small world” (XiaoDi, 小地) is a concept of Jewish philosophy that man; “Adam” is a kind of “microcosm,” of the world as a whole; the “macrocosm” according to the Midrash section Otzar ha-Midrashim 406. Olam katan; the “microcosmic world” conceptually is the understanding that man; “Adam’ is a microcosm that can be termed Adam Olam Katan (קטן) as well as an Adam Kadmon making Adam Olam Qahtan (Joktan, יקטן) an Adam Kadmon (קדמון) archetype, elucidating small (קטן) children as eternal (עולם) life forms. Adam Olam Katan is exemplary of the baby Moshe (משה) in the ark of bulrushes or the baby Yeshua (ישוע) in the manger and Adam Kadmon is the source of the first 3 ShiGan (十干) or Sepheroth. The FuXi LongXih (伏羲 龍解) elucidates the seder hishtalshelus (סדר השתלשלות); “order of progression" of the Arbaah Olamot (ארבעה עולמות); four eternal spiritual world-planes to come. Moving in a circular fashion, the Kav (קו) ray-line of divine light progressively produced the Sepherot (ספרות), first creating Chether (כתר), the highest and most exalted Sepherah (ספרה), the sun-rise, closest to the Khalal (חלל) space of a light far thing (חלל) or hollow-man’s perimeter, the sun-rise begins. Progressively this kav (קו) ray-line as sovev (סבב); “surrounding” light (אור) encompasses curved space, the sun's transit through the sky visibly, therefore revolves and produces the remaining Sepherot (ספרות), culminating with the formation of the final Sepherah, Malchuth (מלכות), the sun-set, at the center of the Khalal (חלל) space of a light far thing (חלל) hollow-man, where is found the origin of the word, echoing the verse of John 1:2: “the same was in the beginning with God; "the sun-rise," in Universal Syphers™ speak is located in GuiGan BuJiGan (癸干 部己干) XiaoYang (小陽). The new emanation is the fountainhead for all subsequent creation, but instead of perfection leads to a catastrophe in the emerging spiritual worlds of Atziluth (אצלות), Beriah (בריאה), Yetzirah (יצרה) and Asiyah (עשיה). In modern cosmological terms this is the Grand Unification Epoch temporally 10-43 through 10-34 seconds after the Big Bang and in Universal Syphers™ speak is known as the period of Bu ShiGan TaiJi (部 十干 太極); the “division of the 10 shields, spheres or doings of the great extreme,” the 10 Sepheroth (ספרות) in immanence going forward the 2nd time or extent. Each Sepherah (ספרה), in this scheme, is a self-contained sphere, shield or doing (干), and each starting with Chether (כתר) to Malchuth (מלכות) is progressively closer to the center of the Khalal (חלל) space of a light far thing (חלל) hollow-man, and therefore, progressively further from the light of the infinite Ain Soph (אין סוף). 2nd/3 ShiGan (十干), the second 10 Sepheroth to emerge from Adam Kadmon in the Hebrew tradition of Jewish Kabbalah is Nekudim (נקדים); points or "speckled”(sparkles) of 10 isolated lights in 10 vessels, an example of unstable Tohu (תהו); “Chaos” entrophied, equivocating to Bu ShiGan TaiJi (部 十干太極); the shattered (שבירה) or “divided 10 shields great angle or curve," e.g. the 10 horns (קרנים) of Revelations 12:3. As the vitality (Yao/Xio: 爻, 효: חיו; “Kav-life lines”) pours (breathed: יפח) into the Sepheroth Kelim (כלים); “vessels,” they are unstable Tohu (תהו); “chaos” and Shevirah (שבירה); “shattered” as the first tablets of stone during the time of Moses in BC AYN 1499 or as Tiamat (תאמת) split and shattered by Marduk. Their divine light (mist: אד) re-ascends, while the broken vessel fragments descend or were cast to the earth, still animated by Nitzotz (נצץ); “sparkles” (speckled) of light. The fragments become the absorbed, mimalei (ממלאי); “filled,” as when Joseph "filled (ימלאו) the sacks" (כליהם) or vessels of his brethren for their return trip to Canaan, and the animating source of the subsequent Arbaah Olamot (ארבעה עולמות); the “4 spiritual worlds” and a new stable creation of Beriah or XiaoRen (小人); "small human" with the realm of Tikun (תיקון); “rectification,” restoration (תקון), correction (Wycliffe), resurrection (renaissance) or reformation (KJ), the He XiaoShiGan TaiJi (合 十干 太極); the “unified small 10 shields, spheres or doings of the great extreme,” the 9th/9 mictlan (מעכת-לן) underworlds in the solar system, the 10 Sepheroth (ספרות) the 3rd time or extent also known as re-construction. First the light creates or constructs the vessels; ohr sovev (אור סבב), next shatters (שבירה), destructs, divides or separates the vessels, then animates, re-constructs or fills the vessels; ohr mimalei (אור ממלאי) similar to the modern concept of digital distributed 3-D printing. 3rd/3 ShiGan (十干), the third 10 Sepheroth to emerge from Adam Kadmon is Berudim (ברדים); "connections or “grisled” of 10 inter-relating lights in 10 vessels and the beginning of Tikun (תיקון); restoration or “rectification,” the archetype forms of order in creation in the process of Tohu and Tikun equivocating to He XiaoShiGan TaiJi (合 十干 太極); the “unified small 10 shields great angle or curve” in the Universal Syphers™, the solar system of Mictlan's Nine Underworlds, the Plan-network of rectification. Tikun (תיקון) in Asian terms is TzouYan’s (鄒衍) Yin (陰) and Yang (陽), that in turn, gave rise to the SiXiang (四極); “4 images,” (פנים) emblematic symbols or Tikunim (תיקונים) elements, the alchemists 4 basic elements or the first 4 subshells of modern chemistry and atomic physics itemized as: XiaoYin (小陰); the lesser negative” corresponding with the world of wind or seed, wood or the flowering of organic life, LaoYin (老陰); the “old (greater) negative” corresponding with the world of water, XiaoYang (小陽); the “lesser positive” corresponding with the world of the jaguar, metal or earth, and LaoYang (老陽); the “old (greater) positive” corresponding with the world of fire-rain. Having completed origin-division-union action (正分合作) the 3 ShiGan (十干) or 10 X 3 Sepheroth’s to emerge from Adam Kadmon, the four position foundation (四位基台) of Unificationism is established. Union-action (合作) is the source of the term Union Jack (Cantonese: Zok, יעך; Hangul: 작, Jak, יעך). The kav (קו) itself, the ray of divine energy which mimalei (ממלאי) filled or animated the Sepheroth (ספרות) with light (אור) further composes the superstructure known as Da ShiGan (大 十干); the “big 10 Sepheroth (ספרות), shields or doings” the 4th time or extent, in the secret image of primordial-man; “Adam Kadmon” (אדם קדמן), examples include Da ShiGan Images and Adam Kadmon, the Period of Sumerian Predynastic Nephelim and the Period of Adam's Individual Generations. The whole linear scheme is called “the image of God,” alluding to the verse in Genesis 1:27 that speaks of God/Allahim (אלהים) “creating man in his own image… male and female created he them” through the Celestial Stem Yin and Yang polarity. Also see The Tao of Biblical Qabalah. The 1st/10 Da ShiGan (大 十干) is Da JiaGan (大 甲干); the “big armour or shell shield or doing” or ShuJiaGan (書甲干); the “writings of the armour or shell shield or doing” is the first Sepherah (ספרה) of Chether (כתר) on the 4th extent; the “book of Chether." 6th/32 PI: the 6th Sepherah (ספרה) Tiphereth (תפארת); ShuJiGan (書己干) or DaJiGan (大己干) on the 4th extent is the context and the content: the Permian Period; a stratigraphy system geologic period spanning 46.7 million years after the Carboniferous Period 298.9 million years ago (Mya) to the beginning of the Triassic period 251.902 Mya, during the 5th Biblical Day-period of Utnapishtim's Creatures Time Age. With creatures such as: Dimetrodon; "two measures of teeth," an extinct genus of synapsids living during the Cisuralian (Early) Permian, around 295–272 million years ago (Mya). Dimetrodons are a species of reptiles of the order Pelycosauria known for their mammal-like characteristics and ability to regulate their body temperature. The most prominent feature of dimetrodons are the large neural spine sail on its back, formed by elongated spines extending from the vertebra. It walked on four legs and had a tall, curved skull with large teeth of different sizes set along the jaws. Over a dozen species have been named since the genus was first discovered in Germany in 1878. The Dimetrodon is often mistaken for a dinosaur or as a contemporary of dinosaurs in popular culture, but it became extinct some 40 million years before the first appearance of dinosaurs. 10th/32 PI: the 10th Sepherah (ספרה) Malkhut (מלכות); ShuGuiGan (書癸干) or DaGuiGan (大癸干) on the 4th extent is the context and the content is the 5th/7 Kings of Revelation 17:10: And there are seven kings: five are fallen, and one is, and the other is not yet come; and when he cometh, he must continue a short space. 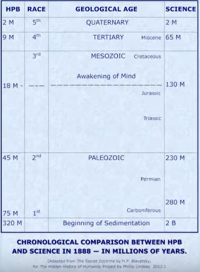 7th/7 Epochs of the Cenozoic Era: Holocene beginning BC AYN 9,999 continuing until AYN 0. This page was last modified on 24 October 2018, at 15:43.